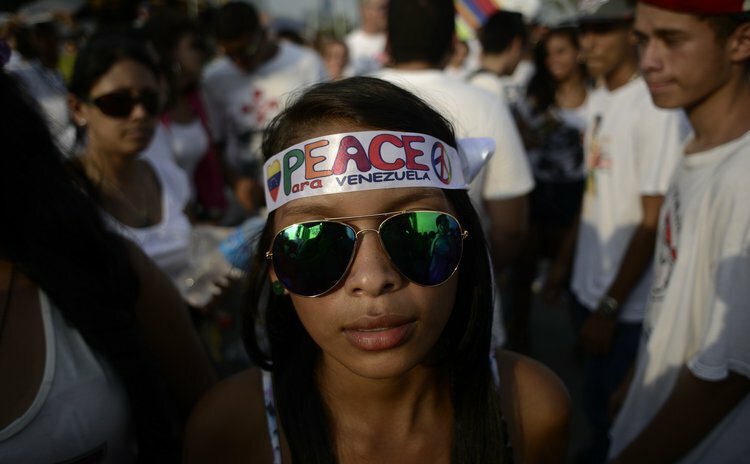 PANAMA CITY, March 24, 2014 (Xinhua) -- A woman takes part in a rally in solidarity with Venezuelan demonstrators, in Panama City, capital of Panama, on March 23, 2014. CARACAS, March 20 (Xinhua/Sun) -- Venezuelan President Nicolas Maduro called on the opposition to return to a democratic and electoral role after five weeks of violent protests promoted by hardline leaders that have left 31 dead and over 400 injured. Maduro participated in a meeting with pro-government mayors and governors to review the ongoing peace plans in the country. He said that the only goal and plan of the radical sectors of the opposition are to topple his democratically elected government. He referred to the case of jailed opposition mayor of San Diego, Vicencio Scarano, who defied the Supreme Court by instigating violence in his jurisdiction, allowing street barricades and preventing the normal life of the public. "Nobody in this country is above the law, the State and the people of Venezuela. How many times have we called upon the opposition to participate in a national dialogue?" Maduro said. Scarano was sentenced to 10 months in jail and removed from his post after he publicly defied a sentence handed down by the Supreme Court last March 12, where it called upon opposition mayors in some towns of the nation to allow free transit in their localities and prevent protesters from setting up "barricades" . Maduro stated the police of that municipality will be intervened in the next few hours to guarantee the safety in that region of the country, which has been hit by violence in the last weeks with the complicity of its authorities. In another moment, Maduro showed a video where the mayor of the eastern Caracas district of Chacao, Ramon Muchacho, publicly told the protests that they aimed to topple the Venezuelan president. Muchacho was also ordered last March 12 by the Supreme Court to allow free transit in their localities and prevent protesters from setting up barricades, known here as "guarimbas" . Maduro said that according to intelligence information, Muchacho was behind all the logistic and support to those violent protestors. He added that the opposition in Venezuela has only tried to illegally topple the Bolivarian Revolution during the last 15 years without a democratic project and respect for the Constitution. "Today in Latin America we have a new picture because the revolutionary forces have achieved the new integration of our countries," he added. Maduro again called on the opposition to participate in the National Conference for Peace and Dialogue set up to discuss different topics of the Venezuelan society.